Are you having trouble wading through all of the information out there on the best beginner hunting rifle? Rifle selection is a decision all beginner hunters must face before they can head out in the woods. With so much information on the internet nowadays you might be having more trouble making a decision than hunters of the past. Ballistics, velocity, bullet selection, it is enough to confuse a new hunter into information paralysis. Up to this point in history hunters often began hunting with their father or grandfathers old .30-06. My grandfather used a .22 mag for years when he was young. In general you are probably worrying too much about your rifle and not enough about the rest of your gear. Regardless, weapon selection is still important and with so much information available on the internet an investment like purchasing a rifle warrants due diligence. If you are new to hunting or rifles in general you should stay away from buying something used. The risk of ending up with a damaged or faulty rifle is not worth the relatively insignificant amount of money saved vs. buying a new rifle. Hunting caliber will be addressed in a future article. The focus of this post is on the rifle make and model. If you don’t want to wait for the caliber article: go with .30-06, .270, or .308. All three calibers are among the most popular for good reason. Ammo is always readily available and can be significantly cheaper than the newer more exotic rounds manufactures keep coming out with. Cheap ammo is important for a beginning hunter because you MUST practice shooting your rifle before you get out into the woods. When you spot that first legal buck you want to be comfortable with how your rifle operates. This leads to another important point: You should start with a bolt action rifle. You do not want to be fiddling around with the more complicated mechanisms of a semi-auto while your heart is pounding and adrenaline rushing as you get the opportunity to kill your first buck. Lastly, don’t spend up on a rifle unless you really have a surplus of money to spare. You will be much happier with a quality, well rounded hunting setup than you will be with a $2k rifle and a cheap pair of boots. The Ruger American Rifle is the best hunting rifle for beginners. The rifle offers tremendous value. The list of features of this rifle matches or exceeds those from every rifle on this list. The gun is very accurate out of the box thanks to its factory bedded stock and free floated barrel. The Ruger American Rifle also features the Ruger Marksman Adjustable trigger so you can set a nice crisp release between 3-5 lbs. The rifle is the lightest weight of the group and handles amazingly well. The recoil is very manageable thanks to the soft rubber buttpad. And to top it off, it is 100% American-made. You just can’t go wrong for the price. Check them out at Bass Pro or Cabelas. The Remington 700 is the most popular hunting rifle in the world and for good reason. The 700 was originally released in 1962 and has been a favorite among hunters, law enforcement, and military snipers ever since. The Remington 700 comes in many variations and flavors. The ADL is a good hunting rifle for beginners. A great benefit of choosing this platform is the enormous amount of aftermarket parts thanks to the platforms popularity. You can customize practically any part of the rifle you want and there are countless options for components like triggers, barrels, etc. Check them out at Bass Pro or Cabelas. The Weatherby Vanguard is another good hunting rifle for beginners. It ranks slightly lower than the two above due to the additional $100 price. 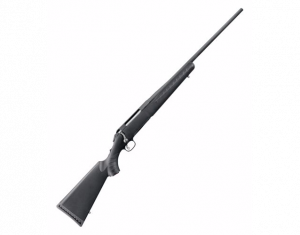 The Weatherby Vanguard offers as good of accuracy as you can achieve from a mass produced factory rifle. Weatherby guarantees sub MOA accuracy out of the box with the recommended ammunition. The two-stage trigger which is adjustable down to 2.5 lbs. is another fantastic feature of the Vanguard. It also has grip inserts to keep your hands from slipping even in harsh hunting conditions. Check them out at Bass Pro. 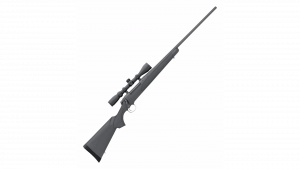 The Savage 110 is another popular hunting rifle for beginners. 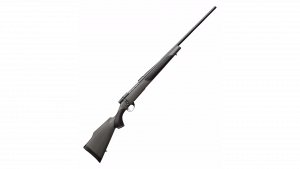 While we don’t have anything against the Savage we personally think the Ruger American Rifle offers much more value at a similar price point. The Tikka T3 Lite is too expensive to really be considered a good hunting rifle for beginners but in our experience the Tikka has proved to be one of the most accurate hunting rifles we have ever used. The Tikka is over a full pound lighter than the Vanguard. If you really want a lightweight accurate rifle and have the extra money to spend you will love this rifle. Ultimately one could argue the for any of the recommend models as the best beginner hunting rifle. All three are great hunting platforms. They all provide a strong blend of accuracy, durability, dependability. Beginning hunters (heck, all hunters) focus too much on rifle selection and not enough on the other pieces of the hunting equation. Just pick one of the rifles recommended and focus on the rest of your gear. We think the Ruger American Rifle is the best beginner hunting rifle. The list of features the Ruger has at the price point is simply amazing. If you are on a budget it makes a lot more sense to pay up for a quality hunting boot and reasonably priced rifle instead of going all out and buying something like a Weatherby Mark V and skimping on boots. Your bloody blistered feet will be a painful reminder of this mistake until you bite the bullet and splurge for quality footwear.